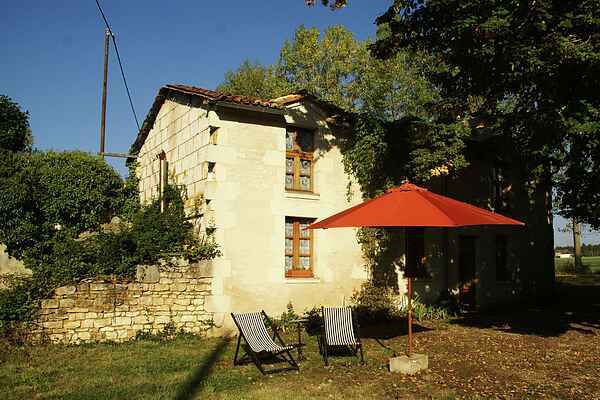 Le Moulin de Boutault is the name of this atmospheric holiday home, a former miller's house. Here, just outside the village of Thuré (1km), you can celebrate your holidays in the countryside with medieval style! The large grounds (1 ha) are a wonderful place to relax. There is a nice shaded patio, a barbecue and a shallow stream flows by just a little further along. Great for the kids! There is a swimming pool, restaurant, bakery and a grocery store in Lencloître (8km). And you will find cycle hire and a disco in Chatellerault. For a game of jeu de boules, tennis or a walk in the woods you can go to the village. They also have a post office here. From your house you're in Chatellerault (10km) in no time, with its beautiful bridges over the Vienne. Poitiers (35km) with its beautiful city center and atmospheric streets is also a great place to go shopping. Also a visit to Angles-sur-l'Anglin (40km), once built on a rock, really is a must. The town is known as one of the most beautiful in all of France! Do you enjoy fishing? The fishing is excellent at the lake in Sossay just 2 km away. For a recreational lake or an 18-hole golf course you can go to St. Cyr (20km). Futuroscope theme park (25km) is fun and educational for young and old.